After a grueling run-up, election day is finally here in the U.S. Over this time period, we've explored how much candidates spent on their merchandise, how candidates appealed to millennials, how some people have gotten into trouble over wearing their candidate's merchandise and more. And now, thanks to Racked, we can dig in even further into the history of campaign merchandise, dating back to Abraham Lincoln ribbons and Henry Clay (he ran in 1824) pajamas. Interestingly enough, the idea of campaign merchandise started with our first president himself. "This idea of little, sort of metal discs begins with George Washington's inauguration," Harry Rubenstein, chair and curator of political history at The Smithsonian National Museum of American History, told Racked. 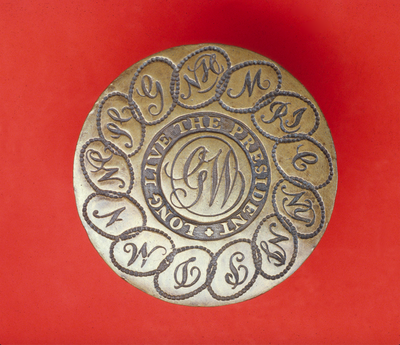 Attendees at Washington's inauguration could purchase brass buttons that said, "Long Live the President" and "GW." It was William Henry Harrison's campaign in 1840 that merchandising became a cornerstone of the campaign trail. Harrison used the "Log Cabin Campaign of 1840" brand to sell buttons, brooches, china, handkerchiefs and replica log cabins—sometimes they even bought them from actual log cabins. "It was so successful that it really changed the nature of campaigning," Rubenstein told Racked. "They'd have torch light parades down the street, and they'd march around with little models of log cabins. This just swept the country." And do you know those round, flat-brimmed hats that seem to only pop up during election season? The reason for this is that those types of hats were wildly popular during the summer elections of the 1800's, so it made sense to brand them for elections. From there, it's been a tradition. Now, politicians have branded just about every item we use on a daily basis—coffee mugs, cellphone cases, T-shirts, towels, you name it. While we aren't carrying any log cabins around this year, it will be interesting in the future.